Just prior to ascending back to heaven, Jesus gave a command that extends to believers throughout the ages that has come to be known as the Great Commission. 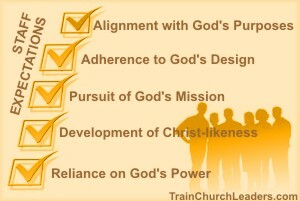 Certainly pursuit of this mission should make the list of church staff expectations. Notice that Jesus doesn’t limit the Great Commission to only people in outreach ministry. All staff, no matter the ministry in which they serve, have been given this mission. Notice that Jesus doesn’t limit the Great Commission to only leaders or paid staff. All believers, regardless of responsibility, have been given this mission. Whether volunteer lay people or paid professional staff, all have been given this mission. Notice that Jesus doesn’t limit the Great Commission to only adults. Believing children and teens have also been given this mission. Notice that Jesus doesn’t limit the Great Commission to only people in upfront, people-oriented ministries. Even those serving in more behind-the-scenes, task-oriented ministries have been given this mission. Notice that Jesus doesn’t limit the Great Commission to only people with outgoing or go-getter personalities. Even the more introverted or laid-back personalities have been given this mission. Emphasize that the Lord is the author or determiner of the primary mission you expect them to pursue. As the One with ALL authority, He has every right to set the agenda, not us as leaders. Our own personal agendas should never get in the way of His mission. That happens when we misdirect our time and efforts into that which doesn’t count for eternity, when we merely spin our wheels and go nowhere, and when we are so absorbed with our own plans and activities that we can’t see beyond ourselves. Remember, Jesus said “GO and make disciples” suggesting that we don’t stay in a rut but progress, that we aren’t ingrown but rather maintain an outward focus. We are to “MAKE DISCIPLES” suggesting that we focus on that which counts for eternity. What is that? — making spiritual investments into people not merely projects or programs. Equip and support people to fulfill God’s mission but also entrust them to the Ever-Present Lord to help them and empower them to do it. When we do that, we should find less and less of a need to micromanage, giving freedom of expression as they depend on Him to direct their paths (Prov. 3:5-6). We should find ourselves praying for and with people to arrive at His desires rather than merely telling them what to do. We must believe that just as the Lord is always with us, so He is with them. We cannot observe staff all the time to make sure they are doing what they should. We can, however, help them remember the One who sees all. To Him they will one day give an account. We cannot be with staff in every situation needing on-the-spot decisions. We should therefore encourage them to learn to turn to the One who is always with them in all situations. We can provide support but cannot be their all-in-all. We need to help them rely on the One who is with them always whose power is constantly available. They shouldn’t be expected to run to leaders with every little need or situation. Extend freedom to tailor their approach to the mission to fit their area of ministry or personal bents within the parameters of not compromising the message or diminishing the importance of the mission. When saying we should expect all church staff to pursue God’s mission, we’re not putting straight-jackets on them. People need to be free to follow the Lord who is always with them in ways that fit who He made them to be or what He gave them to do. We need to encourage ALL staff to see what they do in light of fulfilling Jesus’ mission. Yet, we need to think through how we can encourage, equip, and support those who might find it harder to pursue this mission because of the type of ministry they’re in, their age, or personality bent. How they express themselves may differ from others so we must be careful not to project the same approach on everyone. Yet, the expectation to pursue God’s mission should fall on all. ← Previous Previous post: Staff Evaluations: Assessing Ministry Fit?